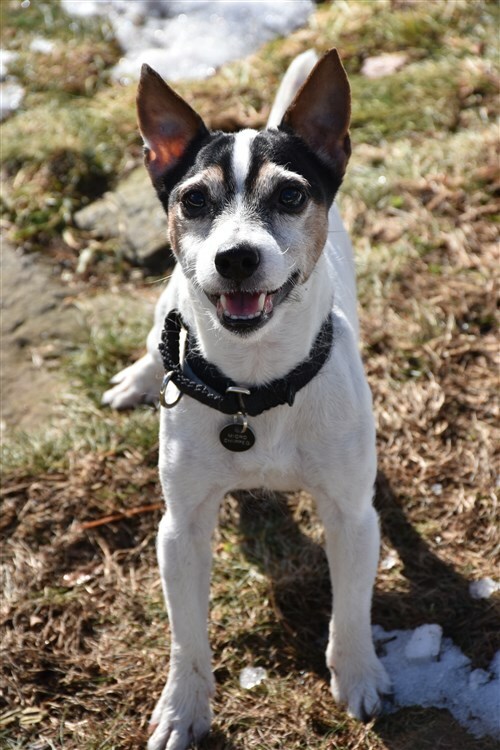 Bosco is a seven-year-old tricolor broken coat shorty Jack Russell who weighs a tiny 9 pounds. However, you should not let his size make you think he is not a BIG dog! Bosco came from the New York SPCA and adopted to a couple who loved him dearly, but once he was in the home, was extremely aggressive with their dog. The good news is, Bosco tolerates other dogs outside of the home very well, and walks delightfully on the leash keeping close by your side as you stroll along. A very adorable little dog with an enormous amount of energy, the one thing that you can be guaranteed is that Bosco will always chase the ball. 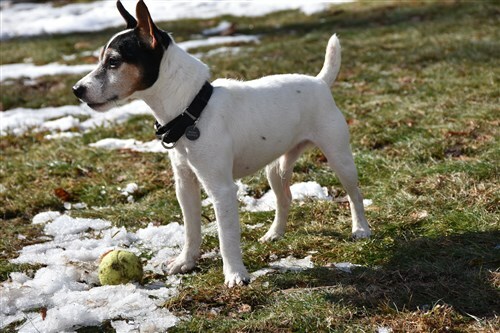 A typical Jack Russell, he is obsessed with the ball. Of course, he will never shun a squeaky toy either, but loves to have the balls around him to make sure there is always one available to be thrown. He is pretty darn smart, and has figured out ways to make his person keep throwing the ball. Bosco is housetrained, but might need a refresher course in his new home. He does well in a crate and is a well-behaved little Jack. He loves riding in the car, just another adventure for this little boy. One of Bosco’s favorite things to do is snuggle, he loves people, and just enjoys being with them, and snuggling under the covers at nighttime is a nice closure to the end of a busy ball chasing day. Jacks Galore is a family run Jack Russell Rescue organization located in Massachusetts. We are here to take the frustration, confusion and time out of dog adoption. Shop at AmazonSmile and Amazon will make a donation to: Jacks Galore, Inc.. Support us every time you shop. Jacks Galore, Inc. is a non-profit 501 (c)(3) corporation located in Massachusetts. All donations are tax deductible to the contributor. The content on this site represent the views of the author and Jacks Galore, Inc. Visitors should perform their own research to make informed decisions.